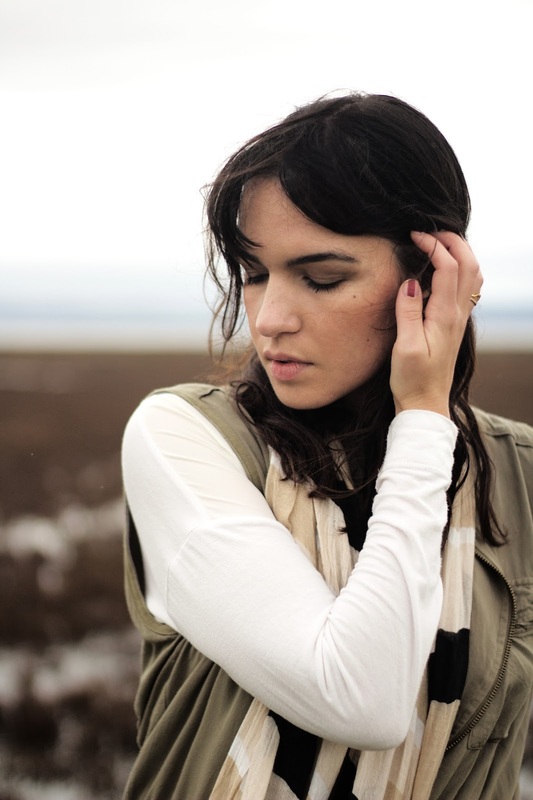 So as you might have guessed from all my "Outfits of the Day" posts, I LOVE Anthropologie. 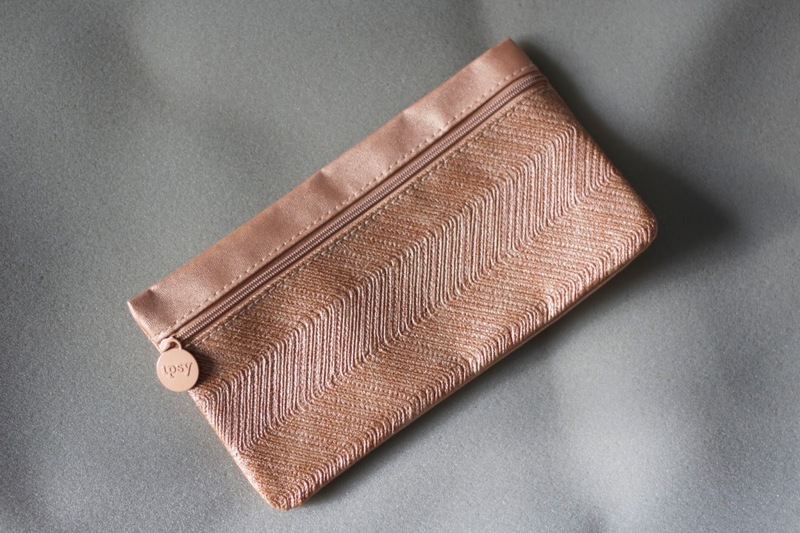 However, a girl can't spend her entire paycheck on pretty, shiny things. I mean, I could, but that's not a very adult thing to do. So I like to do the occasional "Anthro Hack"-a DIY project that copies Anthropologies' adorable, but simple pieces for a fraction of the cost. 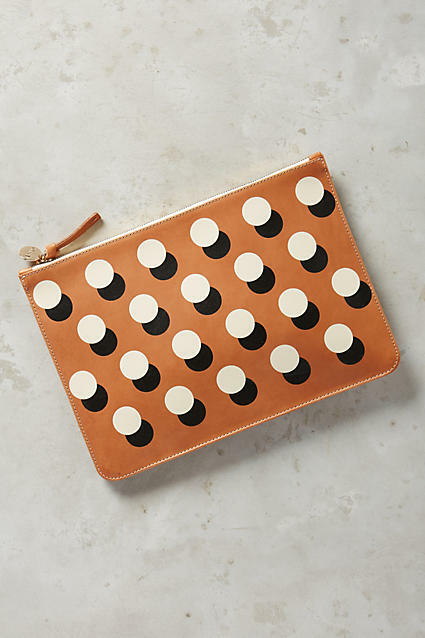 For example, the Clare V. Dotty Pouch is extremely cute, but at $215 I think I'd rather make my own. 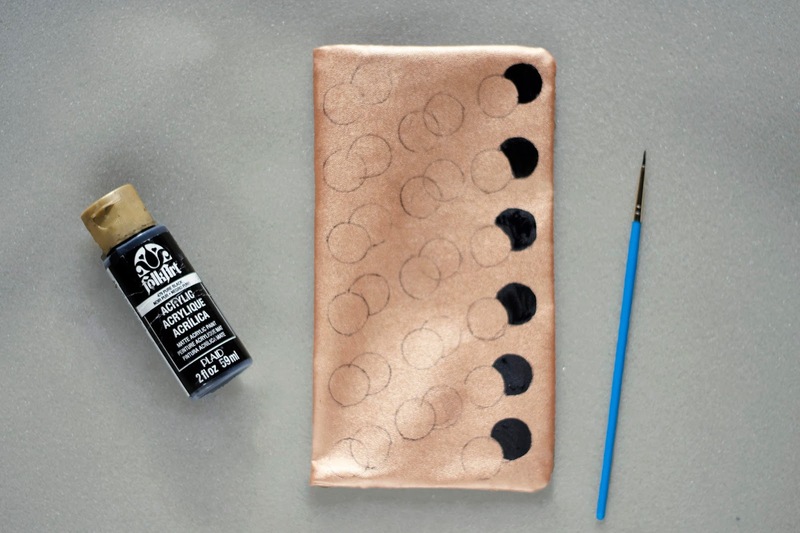 Use your pen/pencil to outline your stencil in a polka dot style pattern across all the bag. If you're a stickler for exactness, get a ruler and measure it out. If you're like me, just eyeball it and believe in yourself! ;) Next stencil the secondary circle to the lower, right adjacent. 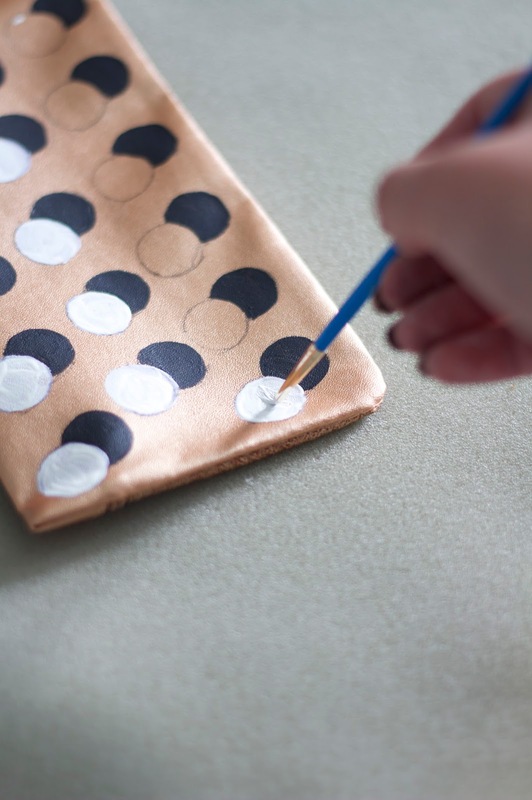 Plan out how many rows fit well on your bag-depending on its size and the size of your stencil/lipstick top. I liked 3x6 for mine. Note: I stenciled each row with both circles before moving on to the next. If I did it again I would have drawn the primary or "white" circles first in a polka dot pattern, then drawn the secondary or "black" circles to fill it in. It would have been easier to get it precise, in my opinion. Start painting the black semi-circles. 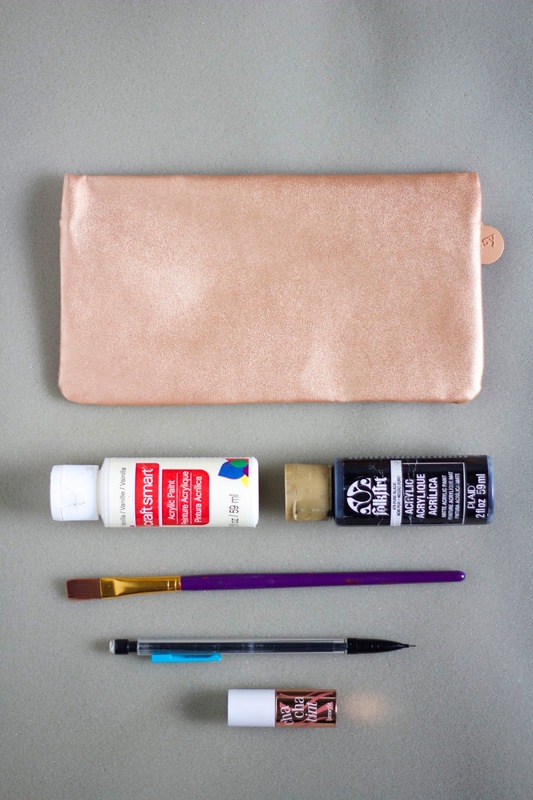 If your bag is textured you may need more than one layer of paint to get into the grooves. Let the black paint dry and clean up the edges and any stray pen marks. Paint the first layer for the white circles. Go with a thin first layer, in case it picks up any of your pen/pencil pigment. You can cover that up easily with the second layer. Paint your final layer of white. Clean up any errant paint or pen/pencil marks and let dry. Now Step 5 could have been the final look. However, I wanted to make it my own and have a clutch handle. 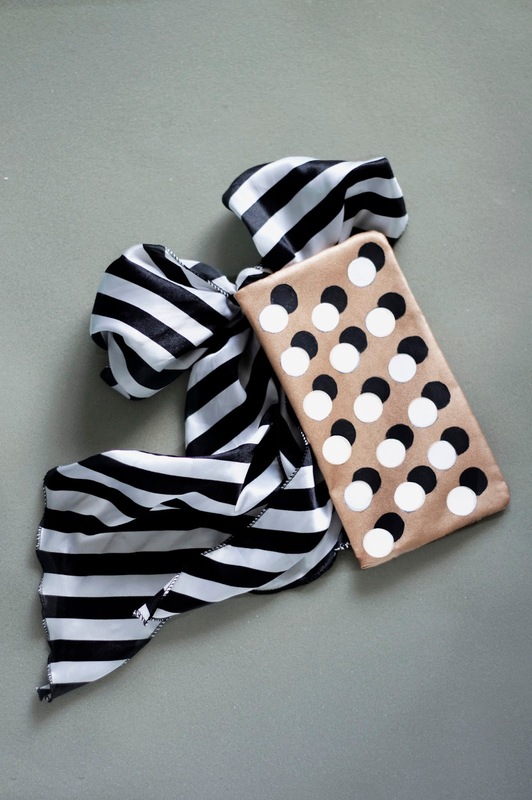 So I added a graphic, skinny black and white striped scarf with a bow to the zipper. To me, this really "pops" and feeds my inner girly-girl. You can choose to add a leather strap or a forgo a bow if you'd rather go minimal maiden than graphic girly. Total Cost: Free! (I just used what I already had on hand). 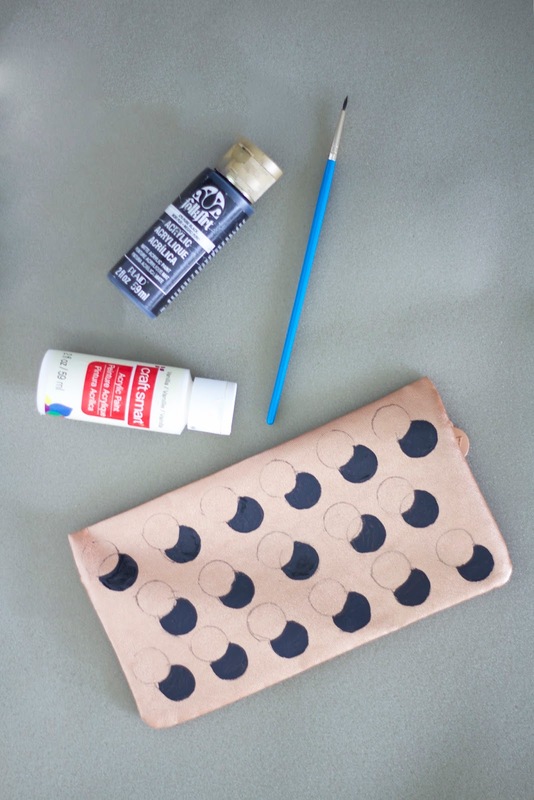 If you don't have the paint supplies and bag you could probably still do the total project for under ~$20. Have you ever tried a "hack" before? Did it come out as you expected (or was it a hilarious disaster)? So cool! Such an awesome hack! Thanks Kelly! Have you ever tried a "hack" before? Did it come out as you expected (or was it a hilarious disaster)? 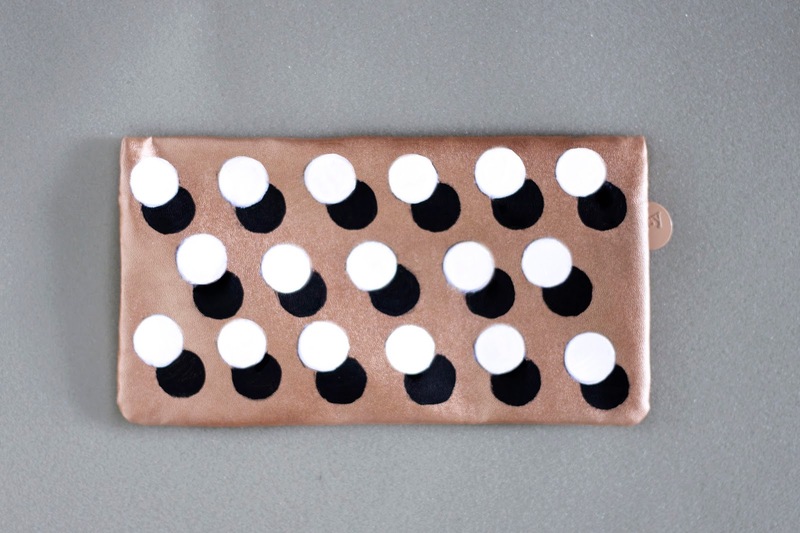 Your DIY clutch looks fantastic and it looks fun to make. I find that when I conquer DIY projects like this one, I really enjoy the item more than I think I would with the expensive original. Thank you so much Ivanna! I like to think about the time and creativity that went into making my DIYs when I use them and it's a wonderful memory. I feel especially proud when I get complimented on them in public. It's like a fun secret I have that I made it. It makes it that much more enjoyable. Glad to see your being an adult and I love your DIY on your purse. Haha, yeah...Adulting isn't always fun, HOWEVER, this turned out to be a very fun adult decision alternative. Thanks Candace! This is such a cute and simple DIY! Thanks Dia! Do you like to try DIYs? Hope this is simple and fun if you try it!